A couple things. Again, don't forget about my giveaway! You have until Sunday to enter. I know I'm walking again, and I can certainly be cooking and posting my own creations, but when Andrea from Made With Pink sent me an email about an earlier request for guest posts, I really couldn't resist. I mean, pretty lookin' baked goods? I'm so in. She mentioned a chocolate chip cookie recipe. 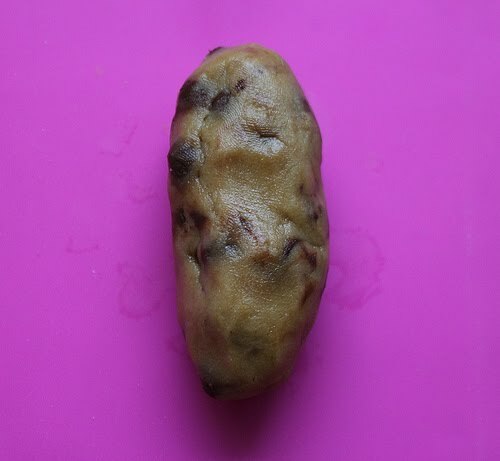 Good old tried and true chocolate chip. Then she mentioned a flake bar, which she will touch on in her post, but if you only take one thing from it: they are awesome. I had a friend play soccer abroad and she brought back all this candy and Flake bars were the star of the show. You'll see. They're great! Anyway, here is Andrea, and I'll probably touch base with all of you this weekend. Enjoy your Friday! 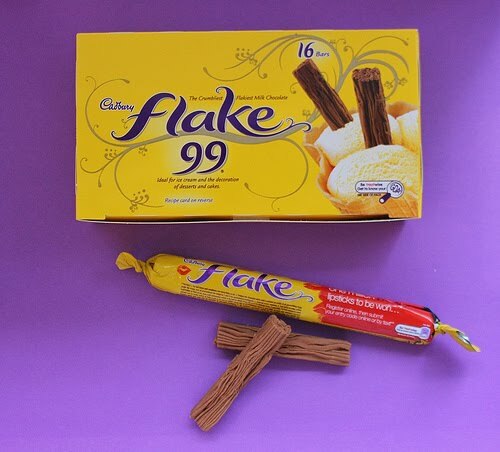 If you live in the UK you're probably pretty familiar with the Flake bar. It's just one of those classic British chocolate bars that everyone here grew up with. It's also one of those chocolate bars you have to bring back home for all your North American friends when you go back for a visit. 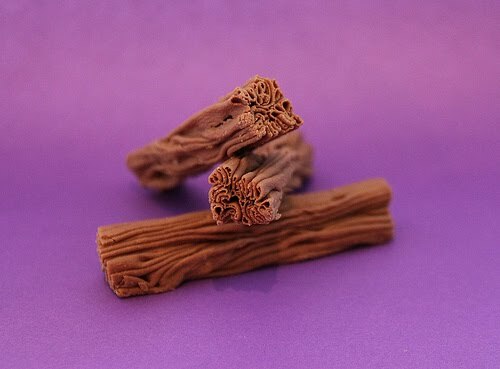 For those of you who don't know what a Flake bar is, it's a totally unique chocolate bar that's sold here in the UK ( as well as New Zealand, Australia & South Africa). It looks almost like a bunch of chocolate ribbons piled on top of each other. It's really quite pretty to look at. But like the name suggests - when you bite into it, those little ribbons break apart and you're left with a pile of little chocolate flakes down the front of your shirt! I know - kind of annoying right? Well fear not! Cadbury has a solution for that. They also sell the Twirl bar which is basically a chocolate covered Flake bar, so when you bite into it you don't get those annoying little chocolate flakes! I've also noticed that they've just released a chocolate dipped Flake bar - but wouldn't that then be equivalent to a Twirl? Except that Twirls are sold in a double pack kinda like Twix bars, and the chocolate covered Flakes are sold singly. Hmmm. Since the Flake bar is a UK classic, I wanted to combine it with another classic. An American classic. The chocolate chip cookie! It's kinda hard to imagine life without the chocolate chip cookie. You may find this hard to believe, but the Flake bar has actually been around longer than the chocolate chip cookie has! But isn't the world so much better off because of both? 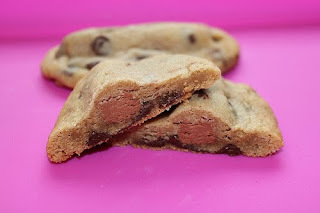 So what better way to celebrate these 2 classics than to combine them into one delicious cookie! Yeah, that's right it's a chocolate chip cookie with a Flake bar inside! YUM! Now in order to make these cookies you'll obviously need some Flake bars, but please don't use the regular sized Flake bars - unless you want foot long "monster" cookies! Instead you'll have to use a smaller version known as the "Flake 99". I have no idea why it's called the Flake 99, and it seems like Cadbury doesn't either. It's a mystery. Flake 99's are specifically made to use on top of ice cream cones and sundaes (remember my ice cream cone cupcakes?). They're about half the size of a normal Flake bar, and come in boxes of 16. Here in the UK you can find them in the same aisle as the ice cream cones and dessert sauces. These cookies are super easy to make. 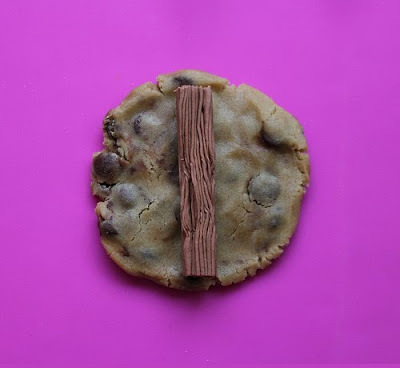 Just take some chocolate chip cookie dough, flatten it into a round disc, lay the flake bar across the cookie dough and then wrap the dough around the Flake bar. They'll end up looking kinda dodgy, but once you bake them they'll look more like the cookies your used to. Here's what they look like once they're done! 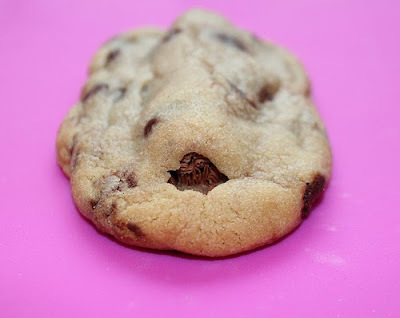 As this cookie baked, it just happened to leave a little hole, so you could see directly into the cookie. See the pretty chocolate ribbons of the flake bar inside! The cookies are chilled before they are baked so the Flake bar stays in tact and is protected from the heat because the heat only reaches cold cookie dough. 1. Combine flour, baking powder, baking soda and salt in medium bowl and set aside. 2. In a large bowl combine the softened butter, sugar and brown sugar. Beat at medium speed, scraping bowl often, until creamy. Add eggs and vanilla. Continue beating, scraping bowl often, until well mixed. Reduce speed to low. Beat, gradually adding flour mixture, until well mixed. Stir in chocolate chips. 3. Take approx 65 grams of the cookie dough, roll it into a ball and then flatten into a disk so it's about the same width as the mini Flake bars are in length. Lay the Flake bar in the center of the cookie dough, and bring the edges of the dough up so that it wraps around the Flake bar. 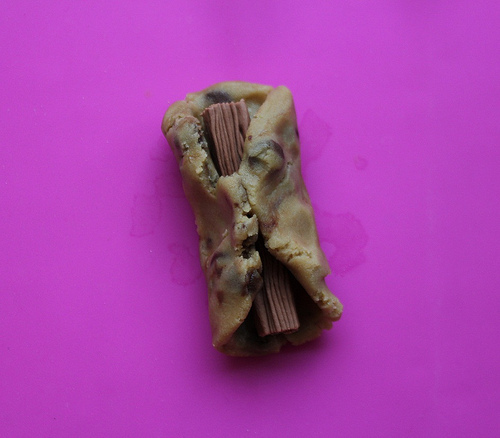 Continue to mould the dough around the Flake bar so it's completely covered. Give it a good squeeze to ensure the dough is stuck to the Flake. After you've done this to all of the cookies, lay them on a ungreased cookie sheet and pop them in fridge for an hour or so. 4. Preheat your oven to 375°F (190°C). Take your chilled "cookie logs" out of the fridge and ensure they're evenly spaced apart on the cookie sheet. They'll expand an inch or so when cooking, so make sure you leave enough room! Bake the cookies for 12 minutes or until light golden brown. (DO NOT OVERBAKE.) Let them stand for a few minutes on the cookie sheets before moving them to a wire cooling rack. Hey, I found your red velvet cookie recipe on FoodBuzz...looks delicious, can't wait to try it! no way! that's an awesome cookie! I am just loving all of these wonderful cookie recipes! I have never thought to wrap cookie dough around a candy bar, but it is brilliant, just brilliant! Oh I LOVE flake! Whenever I see them I always grab a few. They have a couple different varities now, I've seen chocolate dipped and also dark choc I think. SO yummy. Glad to see most of you guys know what a Flake bar is! I was worried that people would have never heard of them before! I'm sure you can also get them at British Sweet Shops if there's any in your area in the US. I love those candies! That is genius how you roll them up. I want to try these now.